H4 Work Authorization, Work Permit or H4 EAD and H4 Visa Issues: I-485 EAD and I-140 are not the same thing - explaining the October 2015 Visa Bulletin. I-485 EAD and I-140 are not the same thing - explaining the October 2015 Visa Bulletin. The new October 2015 Visa Bulletin is very welcoming for many. However, it seems that due to this great news, many are now confusing the possibility the I-140 EAD as what they are seeing on the 2015 Visa Bulletin. This article on the Shah Peerally Law Group website explains the way the new Visa Bulletin as from October 1 2015 will be working. Our present article tries to distinguish the misunderstandings. What will be the I-140 EAD? 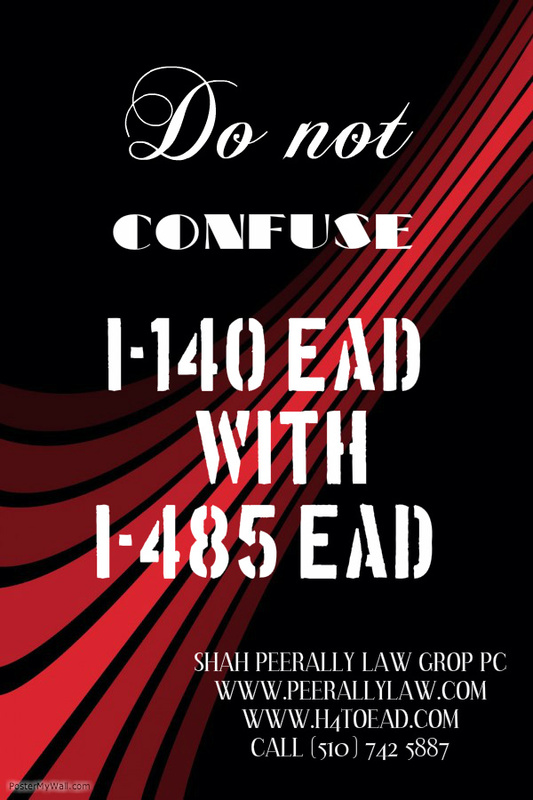 First, the I-140 EAD is not law yet. 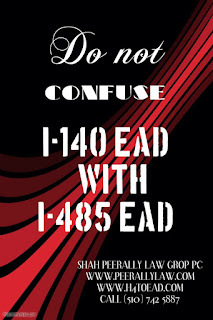 But if it becomes law, you need to understand that the I-140 EAD would be 'stand alone' EADs just like the H4 EAD. This means that they will temporary work permits just dependent on the I-140 irrespective of the company who filed the I-140. The I-485 adjustment of status regular EAD. On the other hand, the new visa bulletin is the regular EADs which are given once an adjustment of status is accepted. Therefore we should distinguish between the two types of EADs. Why is it important to distinguish the two types of EADs? The I-140 EAD would apply to anybody who have an approved I-140 (of course, once the law passes), while the I-485 EAD is limited to those still having a genuine job offer with the company which filed for the I-140. Therefore, if for example, company A filed and has an approved I-140, and someone moved to company B, this person should be able to file for I-140 EAD (once the law passes). As for the I-1485 adjustment of status EAD, it is only attached to the company which provided the petition and is limited to different cut-off dates. There is an argument, however, that if the I-140 if approved with company A and was not revoked, one can still actually file for the adjustment of status (AOS) while working for company B and ultimately file an AC 21 after 180 days of filing of the I-1485 AOS. Note that there should still be a genuine job offer from A to be able to proceed on this although some are arguing there no need to be such an offer. We take the position that there should be a letter of continuation of employment to move forward on the AOS. Now that the Visa Bulletin is divided into two parts, we are all waiting from some clarifications if such permutations can be effected. Until then for those who actually want to file their adjustment of status (form I-485) properly, we recommend using a good lawyer to help. You can call our law firm at (510) 742 5887. Good luck to all of you.